It's been a while since last time. Good to be back, and let's see how much we manage to catch up! I thought I'd start the catch-up blogging with a couple of time sensitive blog posts. First off, I wanted to let you know (or remind you) about a really awesome giveaway that's going on over at Stephanies Pellegrin's blog. I think I first read about it in a tweet from ShadowKissed.net. Stephanie is a fan of Vampire Academy, and was thrilled when she happened to find a display for the books in her grocery store. Stephanie writes that she wasn't sure whether the signatures on the bookplates were real or not. 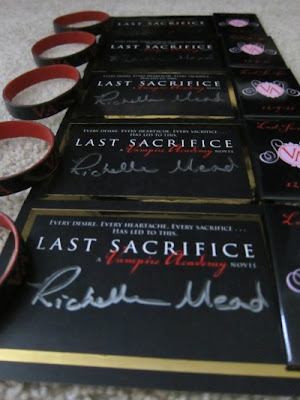 However, if you've been keeping tabs on Richelle's tweets prior to the Last Sacrifice tour, you might have read about her bookplate signing (and also about her search for the perfect signing pen ;-). Stephanie took the opportunity to grab a few of the bookplates and other things, and she's giving away five prize packs with a bookplate, a bracelet and a pin in each. The giveaway is super easy to enter, so you should really visit Stephanie's blog and fill out the form, especially considering the awesome prizes! The giveaway runs through Friday January 14, and its international, so hurry up!